With this content element you can provide unordered and ordered bullet lists, but also a definition list, in the frontend. The content is added in the field "Bullet list", where each new line is a new bullet. 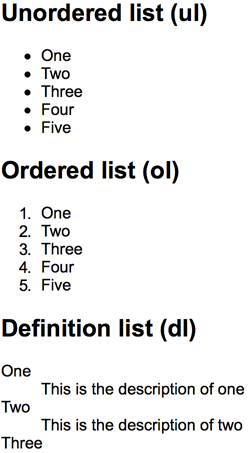 For definition lists you use one line for a single definition which starts with the term, followed by the description, separated by a vertical bar "|". The type of list can be defined with the field "Type of bullets", available in the "Appearance" tab. Frontend output, showing all three types of bullet lists.